T-Chip Intelligent Technology Co. is a hardware and software technology services company, and a few years ago they setup the “Firefly Team” to provide development boards running Android and/or Linux distributions to the maker community. If I remember correctly the company started with Firefly-RK3288 development board powered, as its name implies, by Rockchip RK3288 processor. Since then they’ve launched several other Rockchip development boards and modules, which I’ve covered on this blog. The company decided to send me some of their recent boards and accessories, so let’s have a look at what I received in my “mailbag”. I’ve also taken a few photos for those who did not watch the video or prefer close up photos. 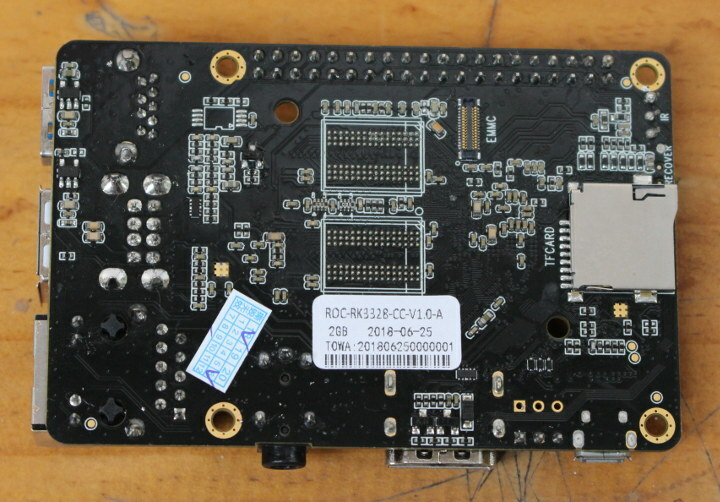 The first board is ROC-RK3328-CC “Renegade” board which was first launched via a crowdfunding campaign by Libre Computer. Both companies have been collaborating on some boards, and Libre Computer makes every efforts to ensure their boards can run Linux distributions with the mainline kernel. Renegade board mostly follows Raspebrry Pi 3 form factor, and you should be able to use most enclosure, and some add-on boards designed for the Raspberry Pi boards. Some key features are the Gigabit Ethernet and USB 3.0 ports for networking and storage applications, as well as HDMI 2.0a port for 4K UHD video output at up to 60 Hz with HDR support. The board ships with either 1GB, 2GB, or 4GB RAM, and I got the 2GB version for review. If you have the 4GB version, there should be two more DDR4 chips on the back of the board. Boot will be done through a micro SD card since there’s no soldered flash storage on this board. You could however connect one of the company’s eMMC flash module for faster storage, but none was included in the package. There was also a micro USB to USB cable in the package. 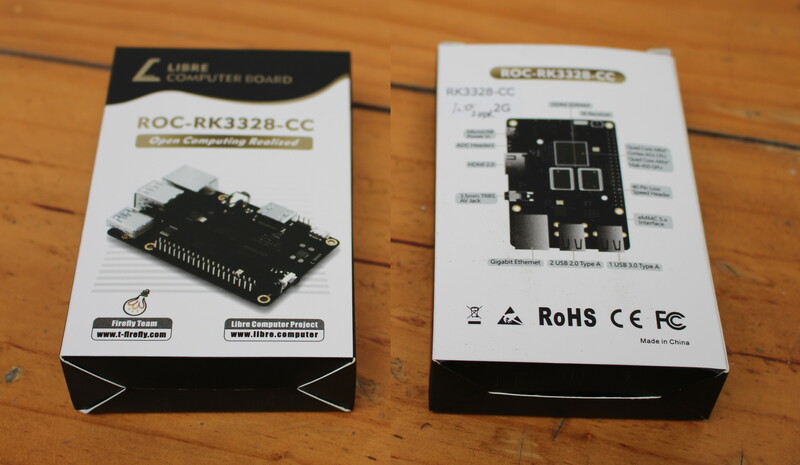 The ROC-RK3328-ROC board can be purchased on Amazon for $35, $50, or $80 depending on your RAM configuration. 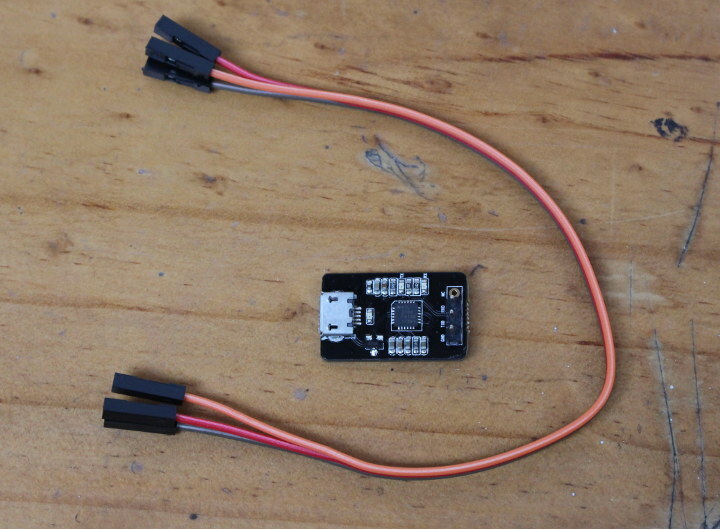 AIO-3399J is the most powerful and features-rich of the three boards I’ve received, and should be well-suited for industrial applications, as well as for companies who plan to design their own baseboard with Firefly RK3399 CoreBoard module. That’s a baseboard + SoM design with a pretty good number of headers at the bottom on the photo above, and all ports place on the other with DC jack, audio jacks, USB 2.0 and 3.0 ports, HDMI 2.0 output, micro SD card slot, and Gigabit Ethernet. 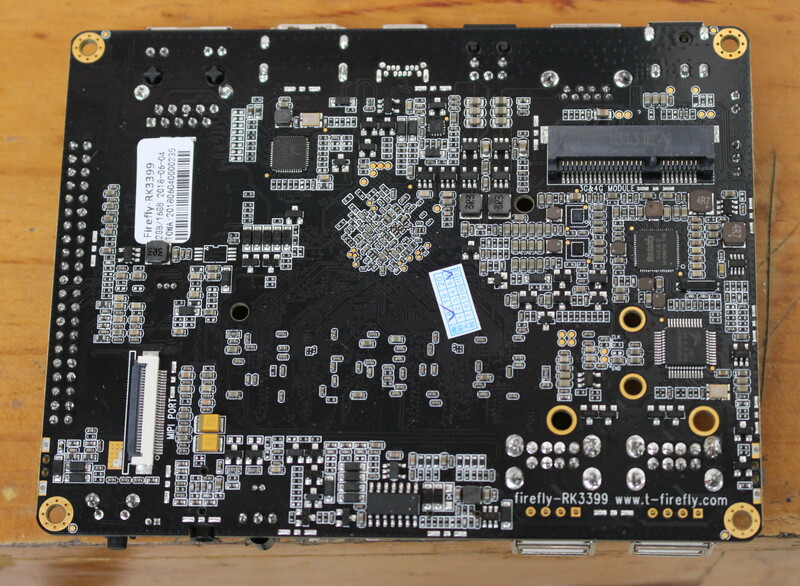 We’ll also notice extra headers on the right for eDP and LVDS displays, the M.2 NGFF socket for M.2 NVMe SSD (no SATA), as well as an mPCIe socket designed for 3G/4G cellular modules. The back of the board features the SIM card slot, two MIPI CSI connectors, and unpopulated MIPI DSI connector, as well as markings describing all those expansion headers in the first photo. I forgot to show accessories provided with AIO-3399J in the malibag video, so here they are…. 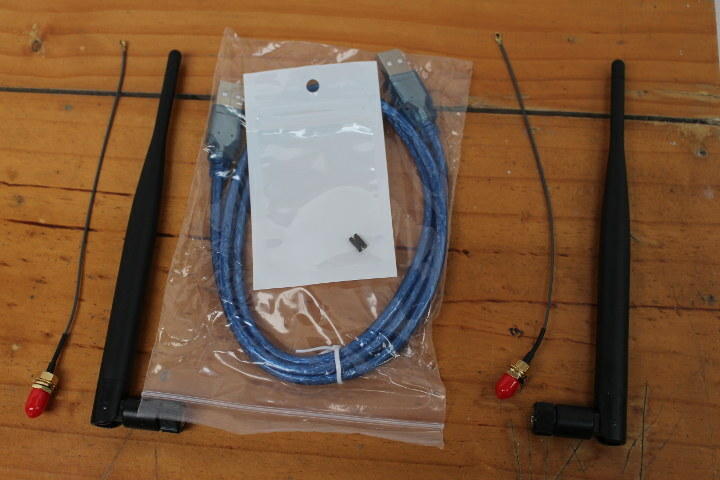 Two largish wireless antennas, a jumper, and a USB male to male cable. That’s it. AIO-3399J industrial mainboard can be purchased directly on Firefly Shop for $165 for the 2GB/16GB version (reviewed here), and $239 for the 4GB/32GB version. You’d also to add shipping. 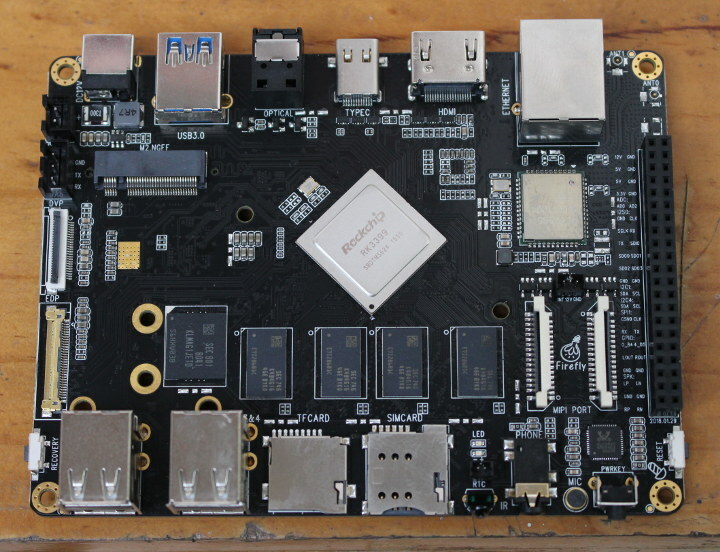 Better suited to the maker community, Firefly-RK3399 board is also based on Rockchip RK3399 hexa core processor, and still offers a good choice of ports and features in a smaller form factor. I have the version with 2GB RAM and 16G eMMC flash, but you could also upgrade to the 4GB/32GB configuration if you prefer. The board comes with dual band 802.11ac WiFi, USB 2.0 and 3.0 ports – including a type C port -, Gigabit Ethernet, SPDIF output and headphone jack, as well as a micro SD card slot for storage, a SIM card holder, and various expansion headers and connectors. 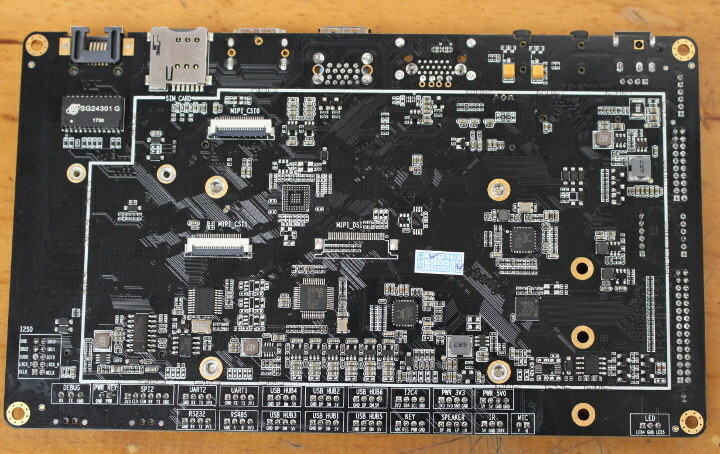 The bottom of the board is fitted with an mPCIe connector for (USB) 3G/4G modem cards, as well as a MIPI DSI connector. It’s worth noting there are four display options with this board: MIPI DSI, DisplayPort 1.3 via USB type C port, HDMI 2.0 port, and eDP 1.3 connector. 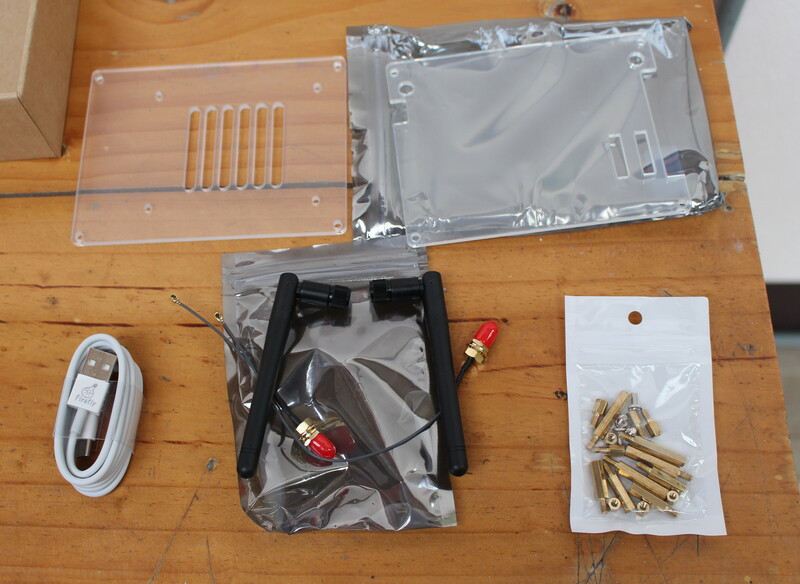 The board’s package also included some accessories which are sent by default with the board, namely a micro USB to USB cable, an acrylic enclosure with spacers and nuts, as well as WiFi/Bluetooth antennas. 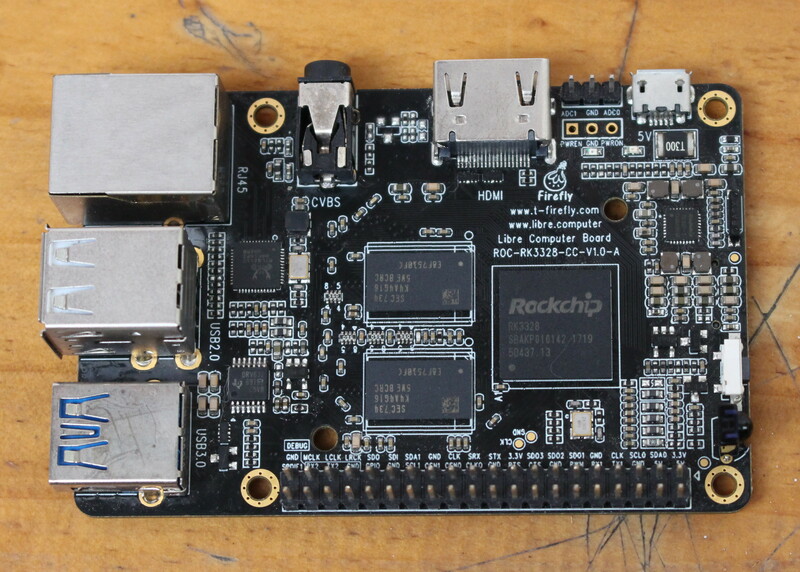 Firefly-RK3399 Rockchip development boards can also be purchased on Amazon for $229 and up depending on configuration and accessories. 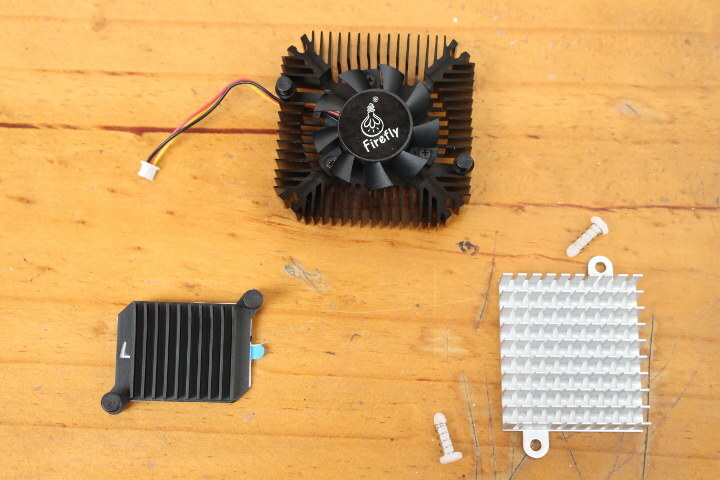 There were also some extra accessories in the package, which may or may not be included with the board(s) depending on where you made your purchase. Two heatsinks and one fansink. A small USB to TTL module for debugging with jumper cables. A M.2 to dual SATA adapter and corresponding SATA cable. 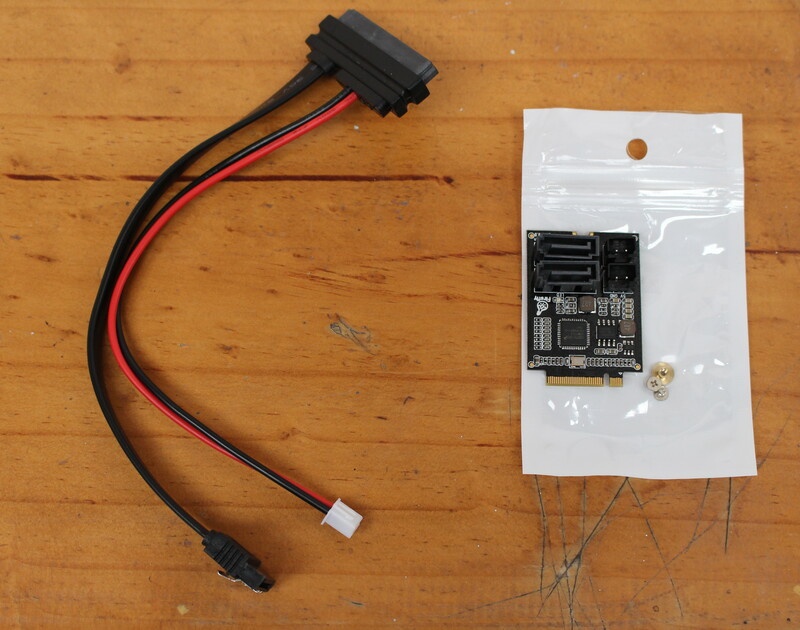 The SATA adapter is designed to be used with Firefly-RK3399, but not with AIO-3399J. For reference, the chip used is ASMEDIA ASM1061 x1 PCI Express to two ports of Serial ATA chip. 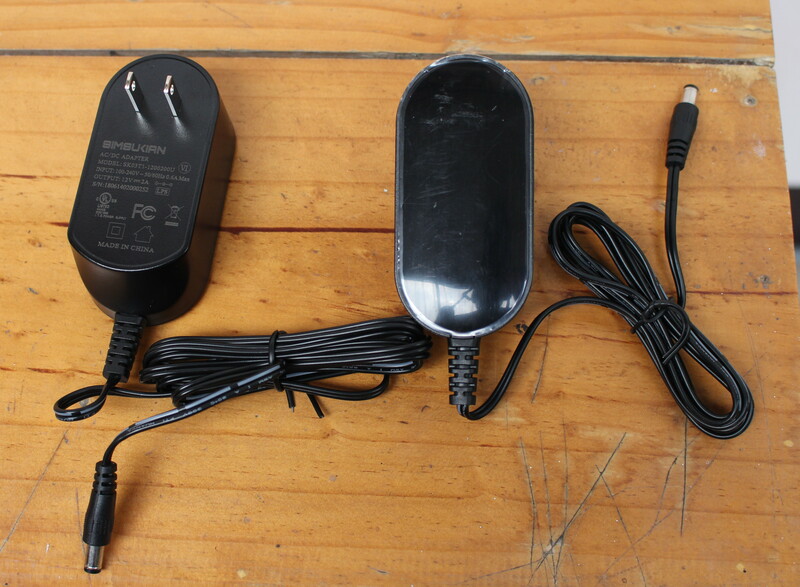 I could also find two 12V/2A power adapter in the package, and I believe those are included when you order Firefly-RK3399 or AIO-3399J board(s). You’ll find all the boards, accessories, and hardware & software documentation on Firefly website. Going forward the plan is to test/review one board per month, and since I have two RK3399 hardware platforms, I’ll probably run Android on Firefly-RK3399, and a Linux distribution on AIO-3399J. Finally, ROC-RK3328-CC would likely be evaluated with a Linux distro based on mainline kernel. The SATA adapter is using M.2 key B (only 2 lanes but since the ASM1061 uses only a single lane it doesn’t matter that much). The problem is that the Firefly-RK3399 also uses key B so an adapter is needed to attach the vast majority of NVMe SSDs. On the AIO-3399J you can neither attach a M.2 SATA SSD nor Firefly’s own SATA adapter since there it’s M.2 key M with PCIe only. So at least common NVMe SSDs can be used directly though no idea how many PCIe lanes are really routed to the M.2 slot. Thanks., I’ll correct the article based on your comments. If you do a like for like comparison of boards, some maybe cheaper but do they offer the same software support? That support needs paying for, I suggest. The dirt cheap model is Orange Pi build and forget !